The Debby line was unknown to me prior to my last trip to Italy. I got these as part of my Christmas present, which gave me an opportunity of trying them out. Debby is an italian based make-up company, part of the Deborah Group. I don't know if you can tell from the pictures but they are mini sized lipsticks, which is really cute. I got the kissMYlips Sheer in Nr. 56, kissMYlips laque in Nr. 33, 38 & 42 and kissMYlips duo limited edition in Nr. 8 & 3. 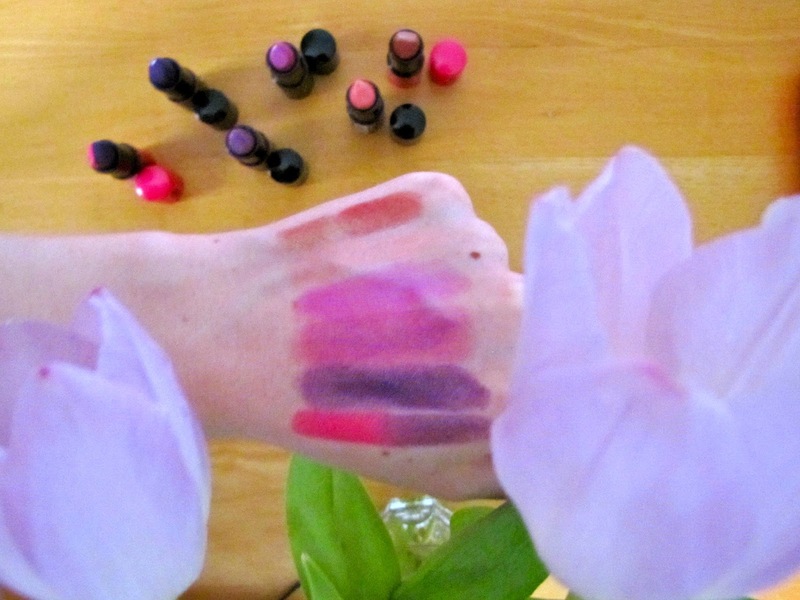 The colours have a decent pigmentation, especially for being sheer lipsticks. Keep in mind that they are a drugstore brand, which I thought was only found in Italy but was surprised to spot them in a Bipa. All the lipsticks are berry scented and have Shea butter in them. They are a little bit hydrating, however if you have chapped lips they will accentuate the effect. When I first saw the Duo Lipstick I was unsure how you're supposed to use them without mixing the colours, but with a little patience it's doable and of course you can layer them. They are perfect for traveling, you want a hot pink lipstick one day and a purple one the other...you have everything in one lipstick tube. Because of the mini size, all of them are good for traveling since you can pack more colours using less space, which is pretty darn sweet for make-up/lipstick junkies. As formula, even if they are pretty good, they do not compare to my YSL and Chanel ones, which have one of my favourite lipstick formulas. However I usually go for highly pigmented lipsticks, so it's not entirely fair to judge them equally, since the Debby ones are marketed as Sheer lipsticks. The plus side is that the Debby ones are probably an eighth of the price, so if your want to experiment with a bunch of colours it's the way to go. Hope you found this helpful. Danke! :) Oh ja, da kann viel zusammen kommen!